You are next asked to enter a root operator password, as shown in Figure 1.20. Type in a password, press Tab or Enter, and then type it again to make sure that it is verified. The password, which is case sensitive, should be at least eight characters (or more) and consist of letters and numbers. Note that the password is not echoed back to the display. Your root password is important because you need it to perform any system administration or user management with Fedora. FIGURE 1.20 Type in, and do not forget, your root password. Do not forget your system's BIOS, boot loader, or root passwords! Some equipment, such as notebook computers, might require factory replacement of motherboard components if the owner forgets the BIOS password. The BIOS settings on most desktop PCs can usually be reset via a jumper or removal and insertion of the motherboard battery. If you forget your boot loader password, use a boot disk (perhaps created during installation as shown later on in this chapter) or boot to a rescue mode by using your Fedora disc and reset the root password, using the passwd command. When finished, click Next to continue with software package selection for your new server. 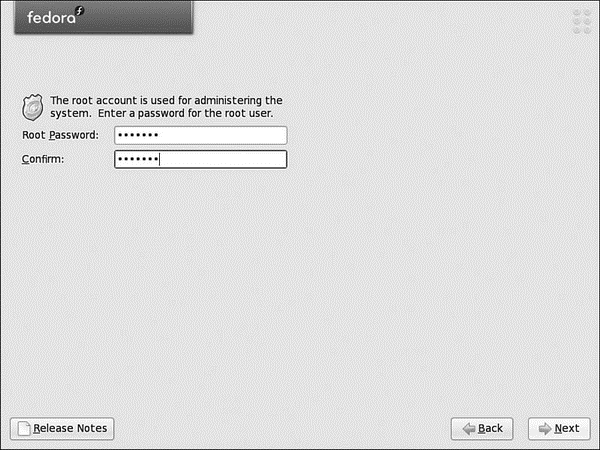 You can create a root account only during a Fedora install. You will have to create user accounts after booting, using a command-line program (such as adduser) or the graphical system-config-users client. Create an account for yourself and any additional users. Usernames traditionally consist of the first letter of a person's first name and then the last name. For example, Tom Denning would have a username of tdenning. Do not forget to enter a password for any new user! If you create a user without a creating a password, the new user will not be able to log in. You should create at least one user for your server in addition to the root operator. This is for security purposes and to avoid logging in as root, either through the keyboard at the server or remotely over the network. The default shell and home directory settings should remain set at the defaults, which are the Bourne Again SHell (bash) and the /home directory. See Chapter 4, "Command-Line Quick Start," for how to become the root user or run root commands as a regular user. See Chapter 10 for details on managing users. Good passwords are essential for system security. However, some people still rely on passwords as simple as admin. This is asking for trouble, and we would encourage you to create a strong password made up of letters, numbers, and even punctuation. It can be difficult to create a password that is easily memorable and that includes punctuation, but it can be simpler than you think. For instance, George Nedeff may want to use his full name as a password, but that would be easy to crack. What he could do is use punctuation and numbers to replace similar letters in his name, such as G30rg3n3defF. This is a very strong password, and not easily broken, but at the same time it is very easy to remember.